My beloved Tibetan friend tells me that in her culture it is bad luck to say that you will never do something again. If you do, it will happen that you have to do that thing again and again – seven or nine times, I forget which. Maybe if you are saying never to something it is because you are resisting this thing, instead of trying to learn from it. After the seven or nine times maybe you will have learned what you need to. Anyway, the point is that I said that this would be the last winter we would be spending in the caravan. I said that I could only do this last one – I was never going to have to do another. On the bright side, the foundations are finished! Apart from some exemplary sand-raking I can’t claim any credit for the work of recent months. It’s been Phil and Jim-the-builder. 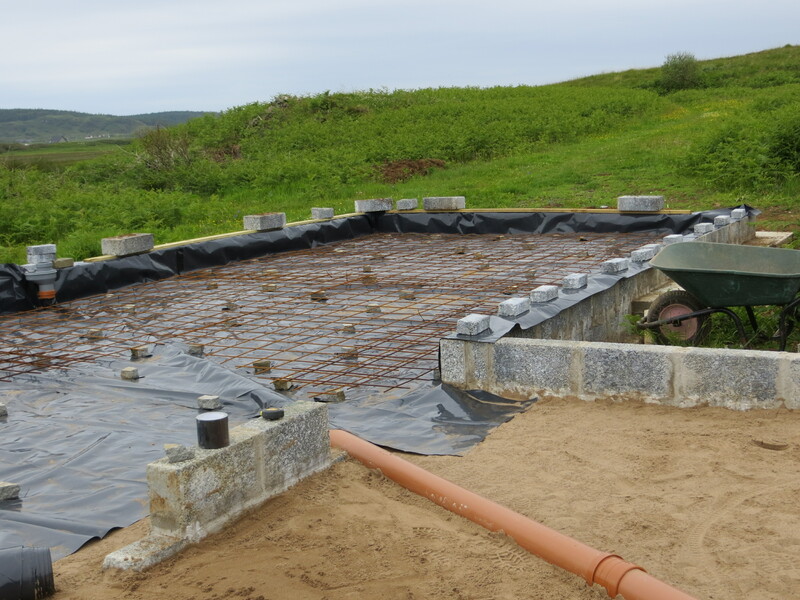 The foundations are impressive and we walk on them knowing that – apart from a layer of tiles – this is our completed floor. 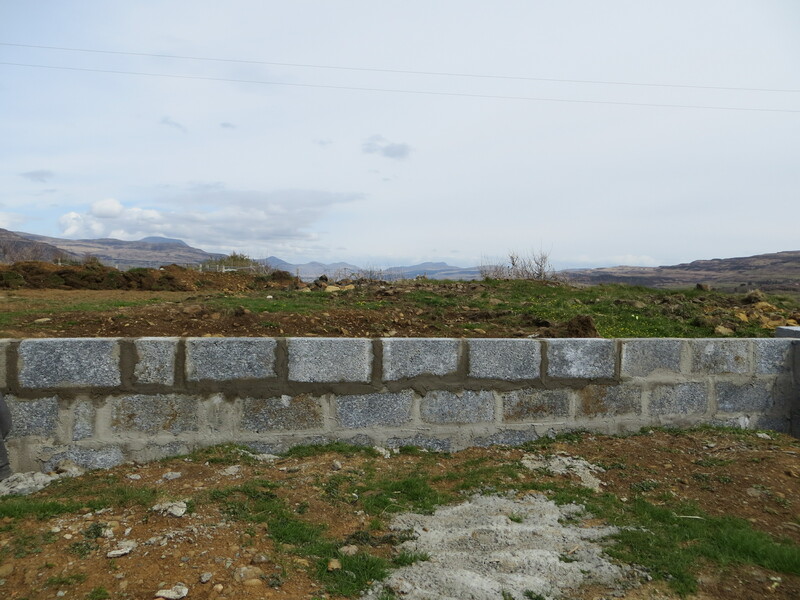 Following to the letter the engineer’s guidelines, which seem to be mainly about pouring in more and more concrete, we could probably build a twenty storey block of flats on there and solve Mull’s affordable housing problem. The environmental consequence of so many tonnes of concrete is painful to contemplate when you are attempting to build something that has a minimal impact; underfloor-heating powered by air-source heat pump, high- value insulation, expensive Nordan double-glazing, Scottish wood cladding and a locally- sourced stone wall. All of these are permitted, some are required, but have to be laid on a foundation that has emitted many tonnes of CO2 in the making, not to mention the environmental costs of extracting more than 50 tonnes of sand, gravel and type-1. And ours is a small house. Back to Tibetan sayings…Unfortunately we need a mortgage to progress from filling in to going up and we are obliged to wait until the Spring – until we have another year of self-employed accounts – before we can apply. We thought we had sufficient years and this has been a massive disappointment – not the last winter in the caravan after all. We feared that we would lose our croft housing grant because we could no longer meet the deadline for being wind-and-watertight. However, the grant people have been great and said that, as long as we keep them informed of our progress, they can extend the deadline and we won’t forfeit the grant. So it could have been worse and we are grateful for that. It means that we have breathing space to finish other, smaller projects – a chicken hut, the greenhouse, the windbreak that was damaged last winter. There is always plenty to do. Our most exciting small project is the upgrading of our friends-and-family hut, the one where people stay because there isn’t room in the caravan. 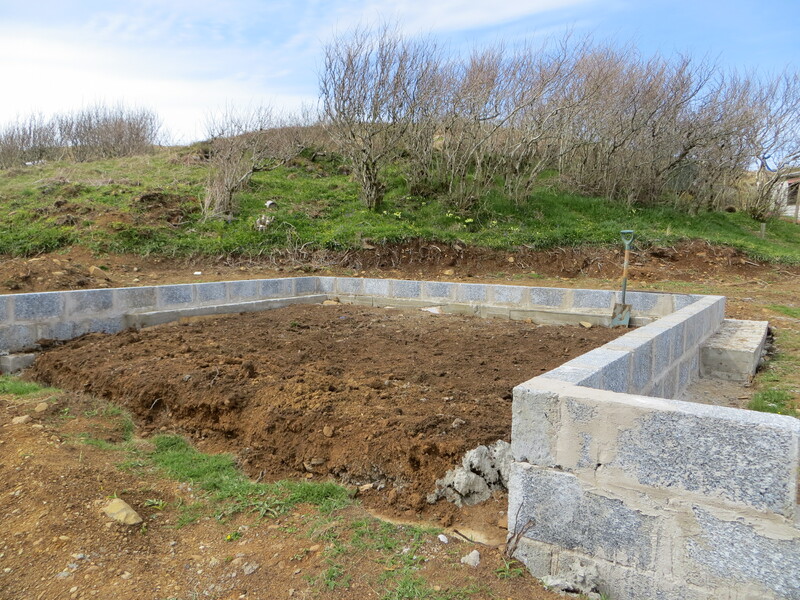 We’re g oing to make it self-sufficient – build another structure for a shower and cooking space, so that we can rent it out to people for holidays. As any spare resources we have are directed towards house-building we are going to experiment with crowdfunding. We’ll see how it goes, but if we get the opportunity to develop our hideaway holiday hut, we will be able to feel that the croft is moving forward, even if not the house. Fortunately winter feels a little waylaid by the beautiful weather of the past few weeks. Warm sunshine, calm winds, mist lying in valleys on cool, dewy mornings turning roosting, rooftop pigeons into stone, or rolling in as the sun sets. One morning I watched as mist poured down the burn into the Loch na Lathaich at Bunessan, while all around the air was bright with sunlight. There is a nip in the air at night to remind us that winter is not far away, and it’s pitch dark by 7pm. But still it feels as though we are blessed by these golden, stolen days of summer-autumn – sweet, fat, juicy brambles started to come out a couple of weeks ago – a month later than usual – and we still have tomatoes ripening in the polytunnel. Perfect weather for putting up a wooden frame for a house, but we’re trying not to dwell on that. We are certainly going to be in the caravan for more winters than we had thought and there have been many nights of waking up sweating, fearing that we may never complete the house. I’m just hoping that if I try really har d to learn whatever it is I need to – patience, humility, surrender, release – that I won’t have to do all of the seven, nine or more winters that I may have summoned. Although, I’m pretty sure that hoping for a short cut is not going to go in my favour when it comes to the assessment of my learning. Phil said something similar – that the most important quality for a self-builder is persistence. You have to do the same thing so many times because there is so much of everything to do. This is especially true when you are doing it the low-tech, low-cost way with few big machines, fewer people and, effectively, in your spare time. When the weather is good enough, evenings and weekends are spent either building or working to make up for days spent building during the week. Many other aspects of our lives are more or less neglected – the vegetable garden, the flower garden, the march of the bracken, the children. The latter seem to thrive on being left to their own devices. We are five weeks into the holidays and to start with the weather was not too bad. They roamed around with their friends, fighting battles and carrying out elaborate spying missions. Or exploring the nearby woods and rocky shores, coming home scratched and muddy. On wet days there has been an over-dose of Minecraft, Harry Potter dvds and video-making. Meanwhile, walking from caravan to polytunnel I have been running the gauntlet of taunting weeds. Past the flower garden that has turned half to meadow grass, giving it, from a distance, the look of a Piet Oudolf “prairie” garden. Past the bracken that is going to soon be reaching over all our heads. Through the vegetable garden where, somewhere beneath the weed-canopy lurk wind-battered dwarf broad-bean plants and surprisingly luxuriant brassicas. This is the area that tells most eloquently the story of neglect, and of the appalling weather. Exceptionally wet, windy and cold since December, with occasional spells of drier conditions, we are still waiting for summer. Everything is so late that our main-crop potatoes have not yet flowered and, in the polytunnel, our tomato plants may never produce fruit. Both our livelihood and this stage of our house-build rely on decent weather. The keeping going is harder on the days when we can neither work nor build. It has been nearly six months since we started digging trenches and we are still in the foundations. Still filling in. 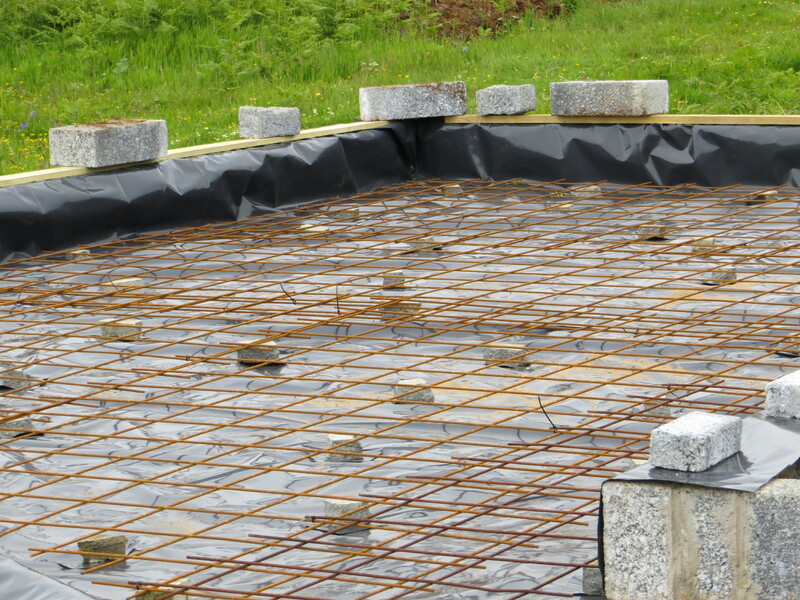 Rocks, type-one hard-core, sand, toilet pipes, damp-proof membrane, reinforcing mesh, anchor straps and concrete slab are all in. 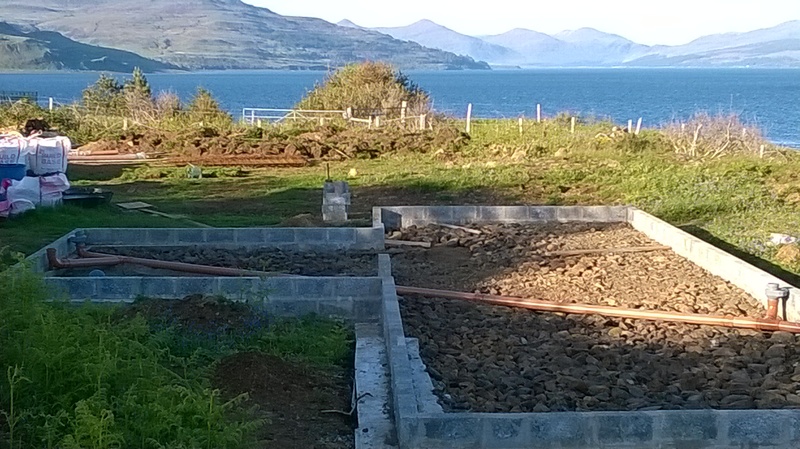 Primary piping, insulation, under-floor heating pipes and concrete screed are still to go. The rain today is relentless, hammering on the caravan roof as I write. The foundations will, once again, be turned into a swimming pool. Once the rain stops we will again have to pump out several inches of water before we can carry on. People ask us how the house-build is going. The answer is: Slowly. Very slowly. Frustratingly slowly. So slowly that it is hard to believe that there will ever be a house. But it is going. I heard my first cuckoo a few days ago at a garden near Uisken and now one has appeared on the croft calling and calling, unrequited in his love and longing. 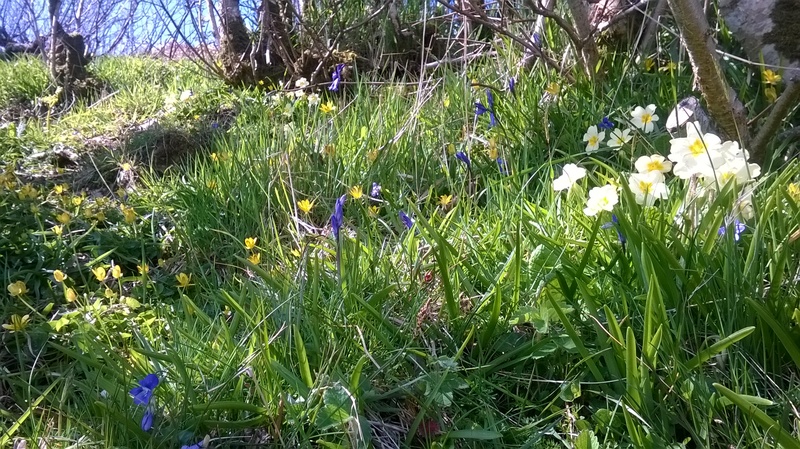 I’ve also seen my first bluebell, late this year, and the primroses have been quietly blooming for a few weeks. They are my favourite Spring flower. Subtle and delicate, they nevertheless manage to thrive in the unlikeliest of places, hugging cliff edges, high up on windy hillsides, and carpeting our little hazel woodland. The bracken has also started to emerge, unfurling its soft, edible fronds, a gentle beginning to the rampaging growth it makes every season. 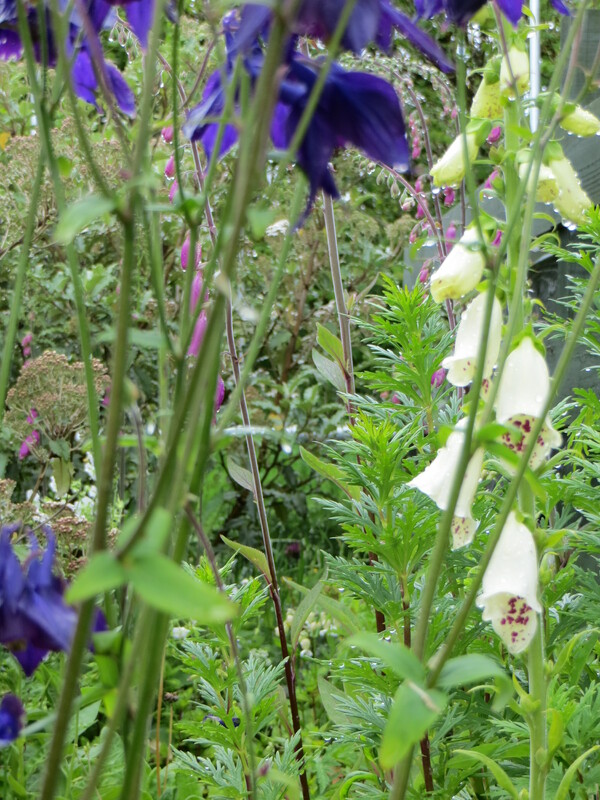 Even the garden beside the caravan is beginning to look like a proper garden with astilbe, hosta, day lilies and geraniums pushing up in clumps that almost outnumber the weeds. And, on the building site, the foundations are, in places, showing above ground level. 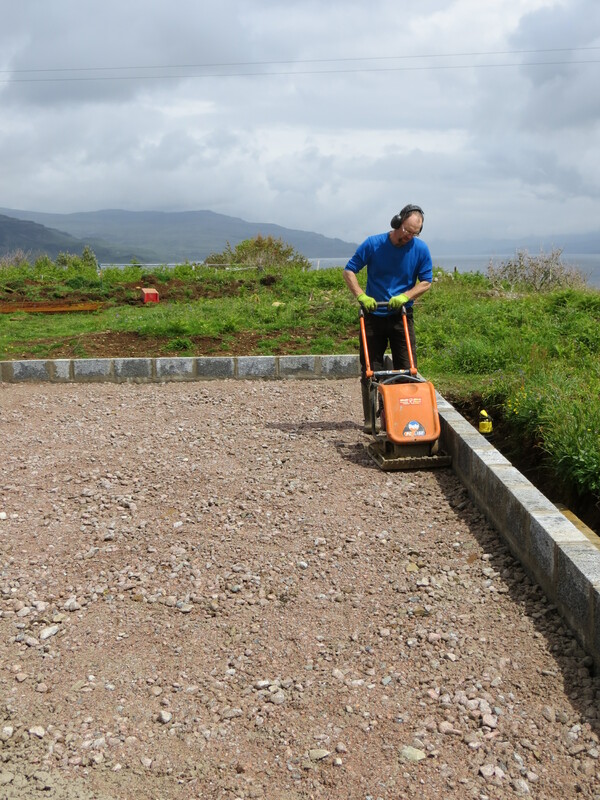 A couple of weekends ago we finished pouring concrete into the footings and Jim came round, almost immediately, a knight in a shining Peugeot, and built the corners. Now Phil is gradually joining them up to make the walls to which we will attach the timber frame that will be the walls of the house. At this point, probably a year or more before we fit them, we have to decide exactly where to put the toilets so that we can leave gaps in the foundation walls for the waste pipes to fit through. It’s complicated. Before the walls are quite finished we have to scrape out the turf from the middle and wheelbarrow it out. Then the walls can be finished and we have to put down some hard-core, waste pipes, a layer of sand, a damp-proof membrane, anchor straps for the wood frame, a concrete slab with a reinforcing mesh, primary water pipes, insulation, under-floor heating pipes and a concrete screed, which we are going to polish for the floor. Then the foundations will be done. As I said, it’s complicated. There’s no step-by-step guide. Every house is different. Even with plans and drawings telling us how to do things and what to use, there is no way we could do this without Jim holding our hands. It’s complicated. It fills our heads. At the moment, our biggest challenge is to find a balance between earning a living, looking after children and all the normal, tangled threads of life, while making time to build the house. Meanwhile, we continue to work through the bureaucratic hurdles, to communicate with architects, engineers and solicitors; to deal with suppliers; to put together a mortgage application, which needs to include an estimate of how much the house will cost to build. It’s hard to think or talk about anything else. We’re not much fun to be around. I have a feeling that when we’re done, in a couple of years, we’ll have a beautiful house and no friends left. Spring is in the air. It turns out that when our pet rabbits escaped for several hours last month, one of them, Blueberry, found a wild mate. She has been nest-building for a couple of weeks, collecting fur from herself and her mum, Snowdrop, and plentiful hay, which they are given to eat. They have done this several times before, it seems to be a cyclical, hormonal thing, so we thought nothing of it. However, on Monday, Bea opened the nesting area to see if they had eaten a treat she had given them – an edible mattress – to find something small and dark wriggling inside the luxurious fur bed. She squealed with delight and surprise. We were relieved that, rarely, it seems to be just one. Sky, the new baby, arrived with the sun. We have had six dry days with plenty of sunshine and, at times, a stiff breeze. The ground is drying and the concrete pouring has begun. We bought a small, electric cement mixer but, thankfully, were unable to start using it. If we had done, we might have lost the will to go on. 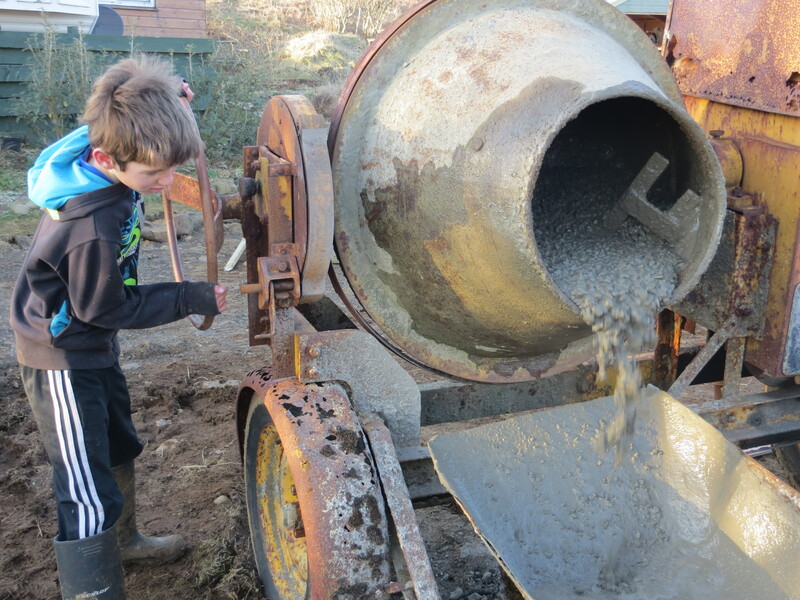 A couple of weeks ago, when we were in the midst of frustration with the weather, our friend Iain offered to lend us his large diesel-powered concrete mixer. 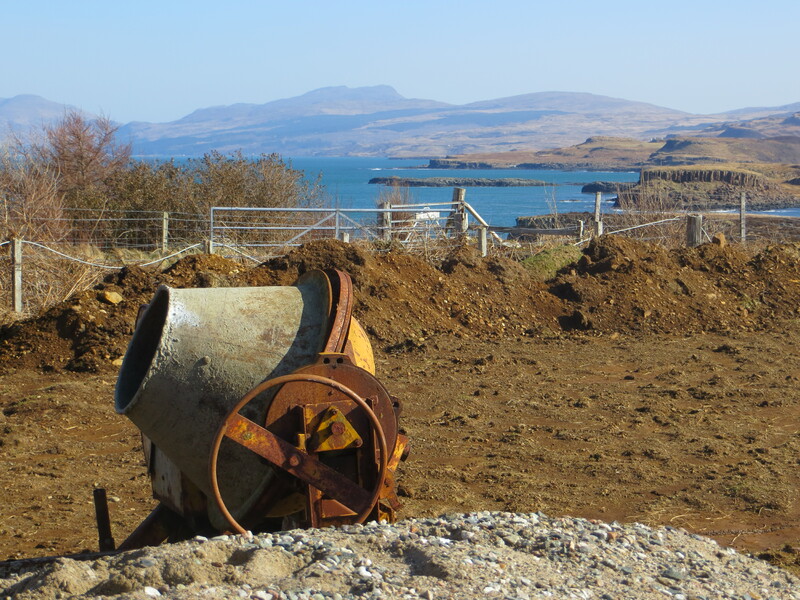 “Jack” – named by us because he builds houses – is a forty-six year old dinosaur of a machine who has mixed concrete for many a house-build on the Ross of Mull. He growls and rumbles along while we go backwards and forwards to him with buckets of water, cement, sand and gravel, and from him with wheelbarrows of lovely, sloppy, concrete which we tip over the crumbling edges into the trenches. We spill bits here and there before we reach the trench, stones and clumps of soil tumble in, sometimes an overfull wheelbarrow ends up half in the trench as we struggle to control the pouring. Jack just keeps on going, a steady background noise that doesn’t hurt your ears, but is a relief when it finally stops. We started on Sunday – a Mother’s Day treat – and a chance for the children to help out. Bea wrote on a piece of wood “Here Lies Our House” and threw it into the trench. Yesterday evening, in the dark, they both put hand-prints on the wet concrete, to join the cat-prints from the previous night. This is their build as much as ours. We’ve started with the deepest, widest trench, the one that the stone wall will be resting on. It’s one metre wide, compared with the 55cm of the other trenches. And, because the ground is so uneven, where bedrock juts through making rises and dips, the concrete will, in many places, be two or three times the 15cm depth recommended by the engineers. We need a lot of concrete. When Iain offered to lend us Jack, Phil expressed concern that we might kill him off. Iain assured him that Jack would kill us first. After two days, 45 bags of cement and five or six tonnes of sand and gravel, I am beginning to see what he means. And we’re not finished yet. We’re waiting for more cement to arrive, so today we gardened for one of our customers and cleaned out our chickens – for a break. Rain has stopped play. It was dry for Will to dig and, it seems, there hasn’t been a day without frequent, cold, wintry showers ever since. For variety there have been a few days of total wash-out. Wind and rain lashing the caravan windows and roof for hours on end until our heads feel as though they have been repeatedly beaten. The trenches have filled with water, been pumped and refilled, time after time. 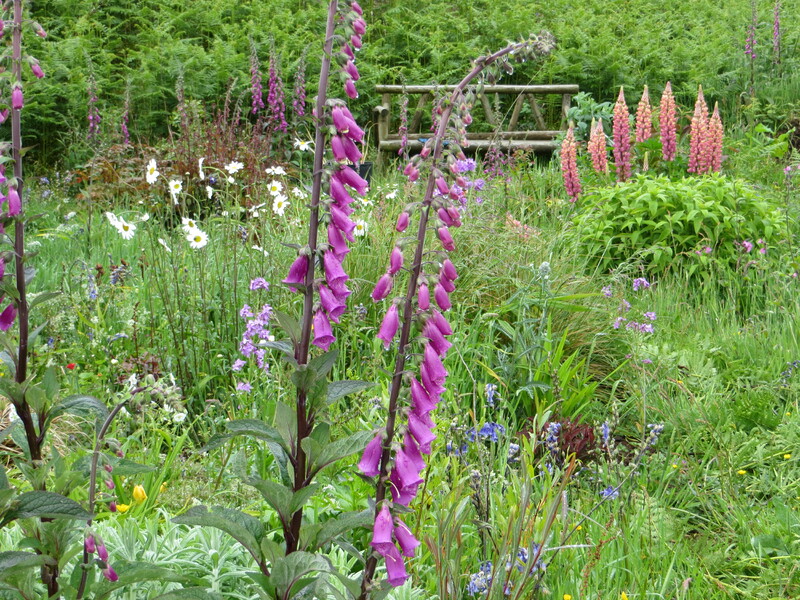 My dream front garden is awash – swathes of standing water, broken only by muddy swamps. The ducks are enjoying it. The rest of us are getting fed up. The trenches needed a bit of finishing off with spades. No-one better than a pair of gardeners for this job. Waiting for a dry enough day was hard. And digging a bed is one thing. Infact, digging out brambles would be light relief after a day of scooping heavy, sloppy, muddy, stony soil-ish stuff out of the bottom of metres of claggy trenches. I must confess that Phil did most of the work and I helped him out for a couple of hours. Long enough for me to acknowledge that my dream isn’t going to come about just by dreaming. My aching shoulders are testament to that. The next step is to wait for another dry-ish day – or two, ideally, to allow the trenches time to properly dry out. We need to measure levels so that everywhere has at least six inches of concrete and then the deepest places up to four breeze blocks and the shallowest places just one. Then we will start mixing and pouring concrete. These are the calculations that have been taxing Phil in quiet moments – how long will it take to fill these trenches to the right height of concrete. I think the most likely answer is that we will know when we have finished how long it took. The weather forecast doesn’t inspire us. Nor does the hail throwing itself at the window as I write. I have had to remind myself that we didn’t move here for the weather. The stunning landscape we are fortunate enough to live in was created by wild, relentless wind, rain and sea, and other, dramatic natural events. It has been beyond the control of humans and will always be so. I can’t really expect that to change just for us to build our house to our timetable. 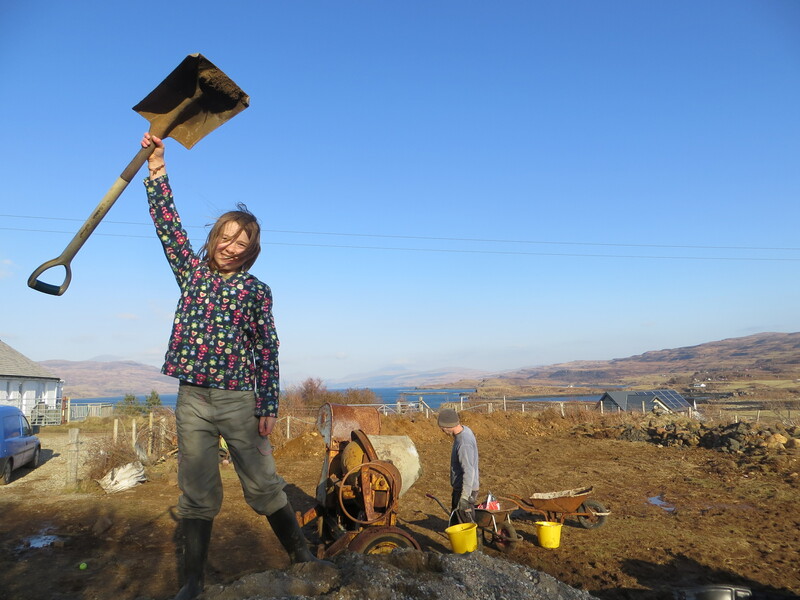 From the very beginning of the process, from buying the land, through planning permission, crofting procedures, building regulations, to waiting for dry weather, so much has been at the whim of unfeeling, inconsistent, powerful forces beyond our control. It will be worth it in the end. Patience. Surrender. Acceptance. And don’t forget to breathe. We have trenches! After two or three days of digging a track and moving soil and rocks from one place to another, it seemed as though nothing was happening fast. Then in one afternoon we had foundation trenches. They are narrow enough to jump over and stand in the kitchen washing dishes or sit on the sofa looking at the view. That first evening I came back from the polytunnel with eggs and salad, jumped through the front door and stood at my picture window watching the light fade from the mountains. We had a few days of dry weather for digging, but it’s started raining again and it’s very muddy, especially where we have top soil from the trenches spread over the area that will be our front garden. It’s not the best soil, but fine for planting trees which is the first stage of my garden plan. I am dying to get started but it makes no sense until we are past the stage of machinery coming and going. That might be quite near the end when Will comes back to dig for the septic tank and Puraflo system. I’m hoping that I’ll be able to persuade Will to hang around for a while at that point and do some landscaping. It will be quicker than me and my spade – hours rather than days. I had always hoped that our build would be low-impact in terms of materials, design and the build-process. In keeping with that, Will’s digger is relatively small, but still the power compared to my woman-power is fabulous – it would be crazy not to take advantage! I often day-dream about growing trees. Silver birch, hawthorn, beech, larch, alder. In my more fanciful moments, caught by a wave of nostalgia for the trees of my childhood, I picture ornamental cherries in blossom. That’s usually when the wind has dropped and I forget where I live. Meanwhile, Phil has that look on his face again. The cement-calculation look. 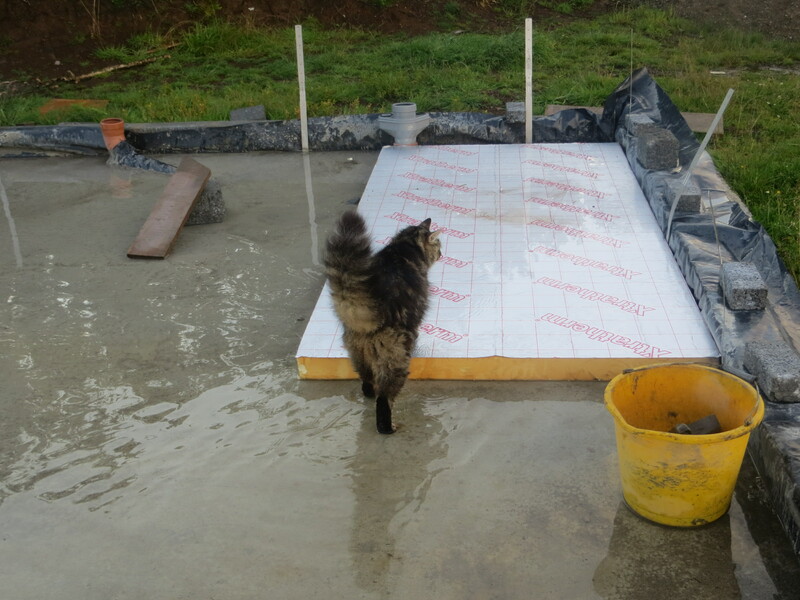 He’s also doing blockwork calculations for the next stage of the foundations. 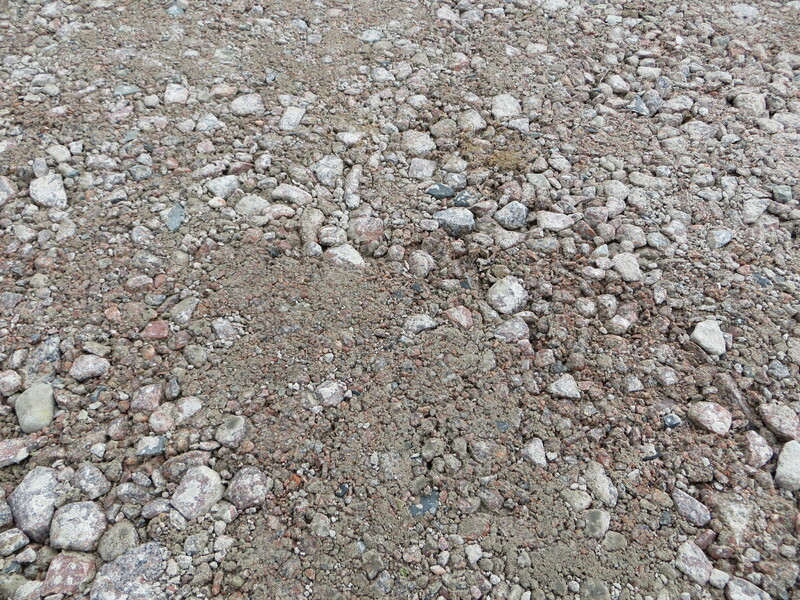 And ordering things – cement, sand & gravel, breezeblocks – a few shades of grey. It’s good that one of us has his feet on the ground. 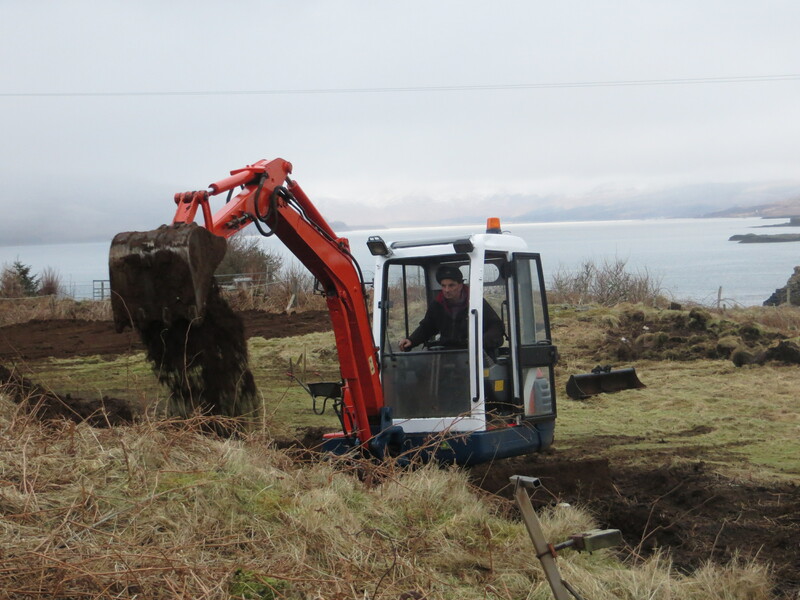 The digger has arrived and, after only a day and a half of digging, the landscape of our house site has changed. Rises that we thought followed bedrock lying near the surface turn out to be piles of rotten rock, stones and earth overgrown with grass. The rock is perfect for filling in the huge hole Will has dug for the new drive. Meanwhile, a hill needs to be taken back to make space for us to get in where the door is meant to be. The first couple of metres are soft and easy. 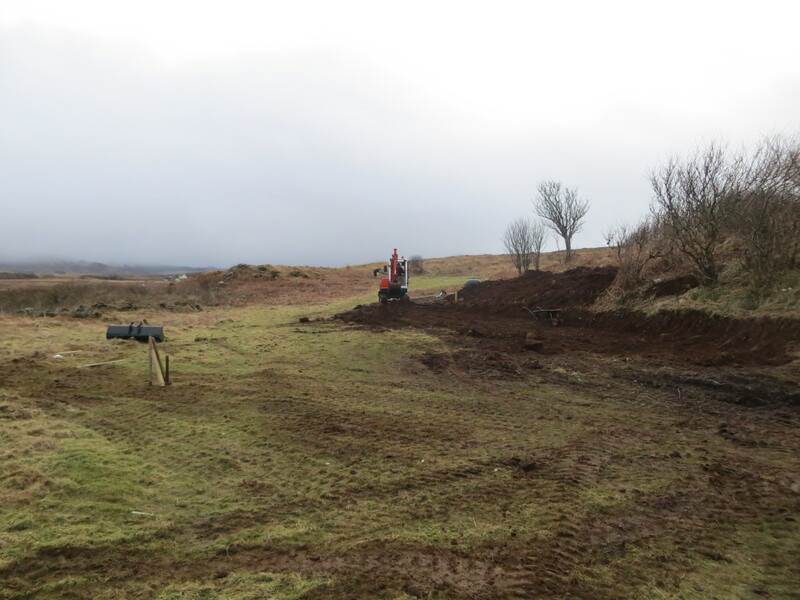 Will thinks that what we imagined was a natural gully behind the house site had been quarried, creating artificial dips and rises that are easily levelled. A landscape that we thought immovable is flattened and widened in a couple of hours. Everything looks different. It also seems that our lives will never be the same again. Today Will and Jim-the-builder both gave up their Sunday to mark out the foundations. With sketchy architect’s drawings and incomplete information from the engineers, they banged in posts and nails, checked and rechecked measurements, tripped over the ridiculously-coloured dark blue builders’ line, checked the angle of the front of the house for the best view down the loch, and finally were happy. It was heading towards dusk by the time they finished, the end of a dreich day that had even leached the colour from a ghostly, white rainbow that appeared over the murky loch. It was in keeping with the feeling of unreality that has crept over us. Phil and I are both in a state of shock. It’s like having another baby – a house-building baby-monster that is totally consuming and has rendered our brains mush. I suspect we will be dining on pringles, pasta and chopped carrots for the next two years. And eggs for protein. We have plenty of those. It’s not so much that we have no time to cook, more that there seems no space to think about it. We are also going to be spending a lot more time cleaning up mud. Living in a caravan in a field was always a fairly mucky lifestyle choice. Living in a caravan on a building site is a hundred times more so. I escaped to the polytunnel this afternoon and entered a different world. 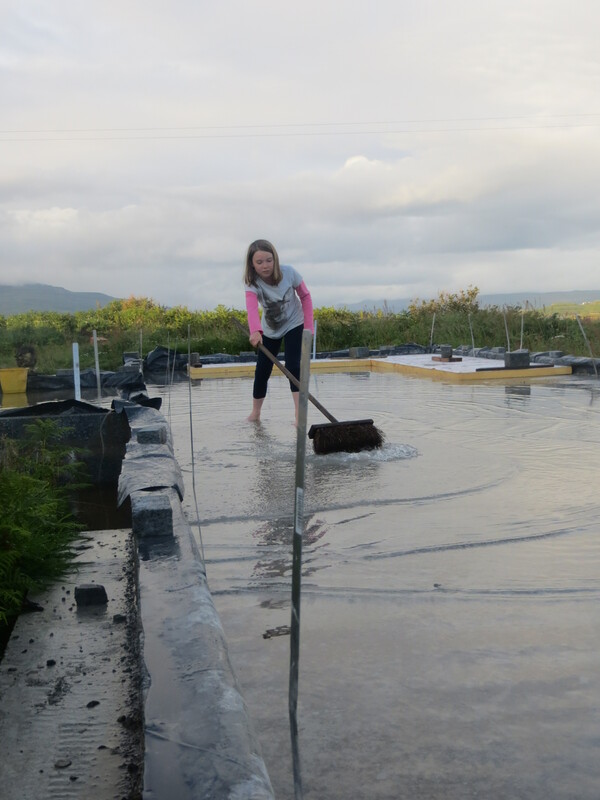 It is the start of our second polytunnel season and there is already a sense of a natural rhythm developing – so different from the extreme action on the house site. I sowed peas and broad beans collected by our lovely Wwoofer Lizzie from last year’s plants. They were dried in the polytunnel, hanging from the crop bars to keep them away from the mice. My sowings are also hanging – perched on a high shelf that we put up after the mice devastated two autumn sowings of sweet peas. I can already taste the broad beans, podded and still warm with french dressing, basil and parmesan cheese. The peas won’t make it to a plate. Like two large mice, the children will pick and eat them on site, leaving scatterings of pods littering the floor of the polytunnel. I won’t mind. That kind of mess I like to see.